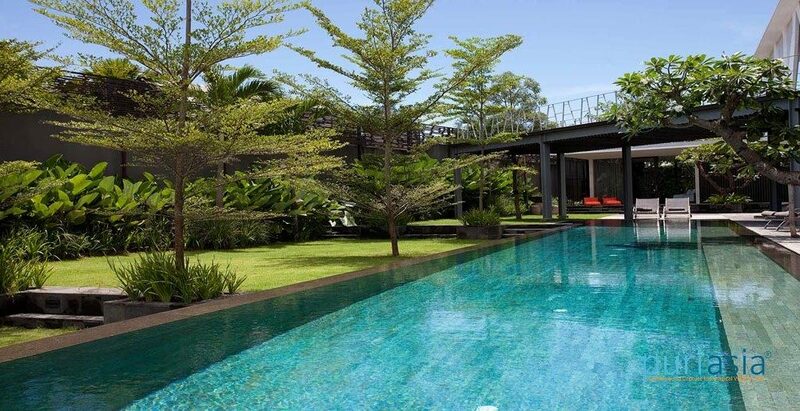 Villa Issi Bali was designed by internationally acclaimed and awarded architect Budi Pradono from Jakarta. 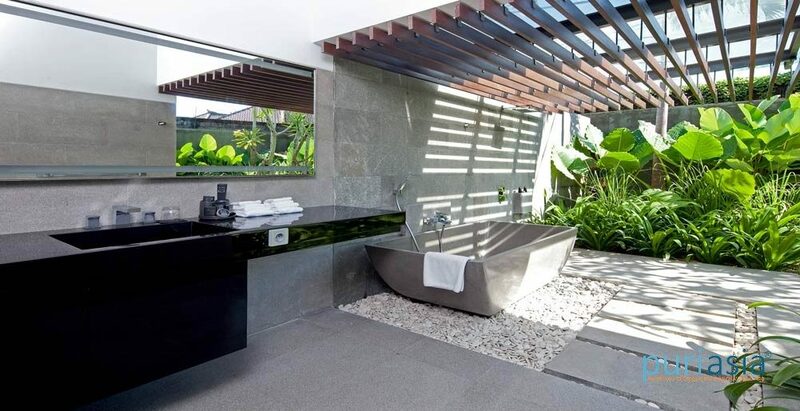 This Seminyak accommodation’s architectural and interior design is exceedingly modern and is complemented by its spacious and serene garden surroundings. 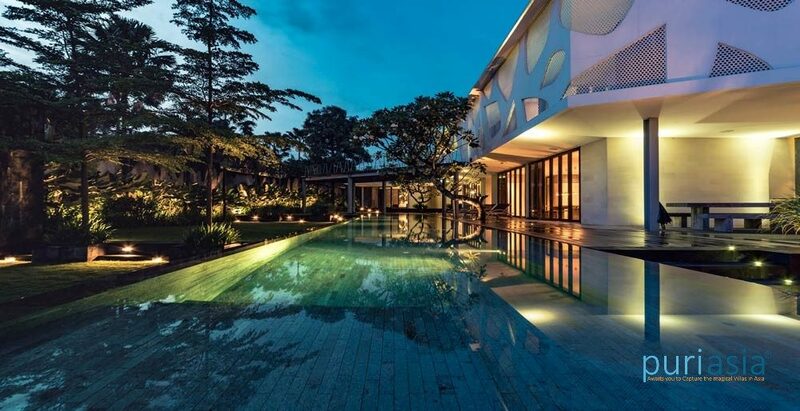 Blending elegant finishes with superior amenities, this masterpiece in luxury accommodation in Bali takes advantage of its tropical location with an abundance of glass walls and floor-to-ceiling glass doors that can be closed for air-conditioned comfort or fully opened to create a semi-alfresco ambience. 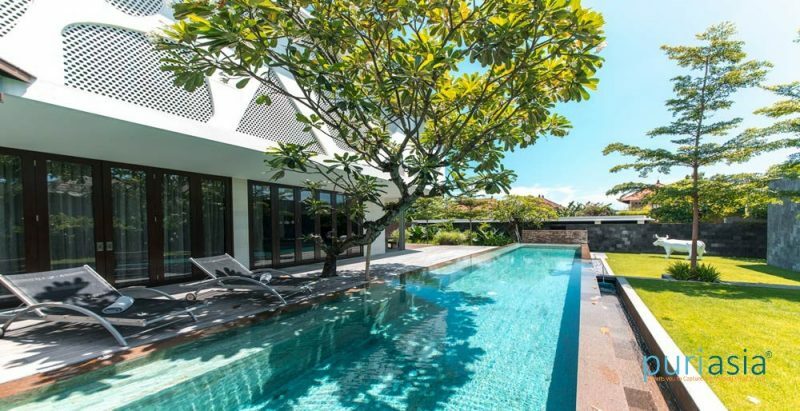 This alone makes Villa Issi an outstanding Bali luxury resort. A defining feature of the monochromatic-themed Villa Issi Bali is the perforated steel and wood exterior screen on the upper level, which shades the sun and plays on the shadows, creating a beautiful soft diffused light. 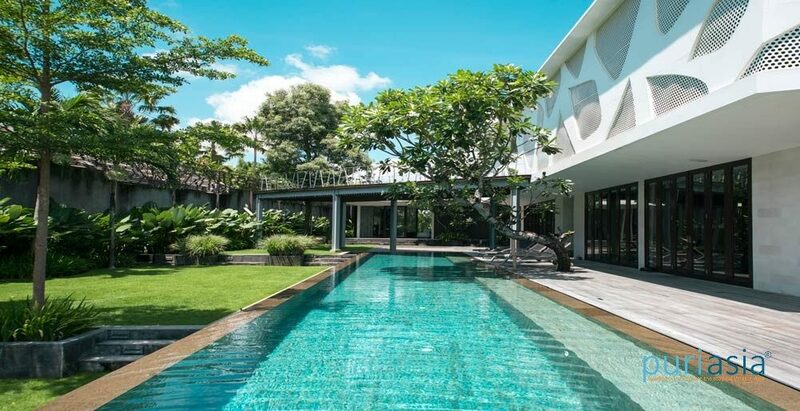 The four-bedroom Bali luxury resort comprising the main two-storey building, self-contained two-bedroom guesthouse and stand-alone gym is finished off by a stunning 25 metre infinity edge swimming pool for all guests to enjoy. 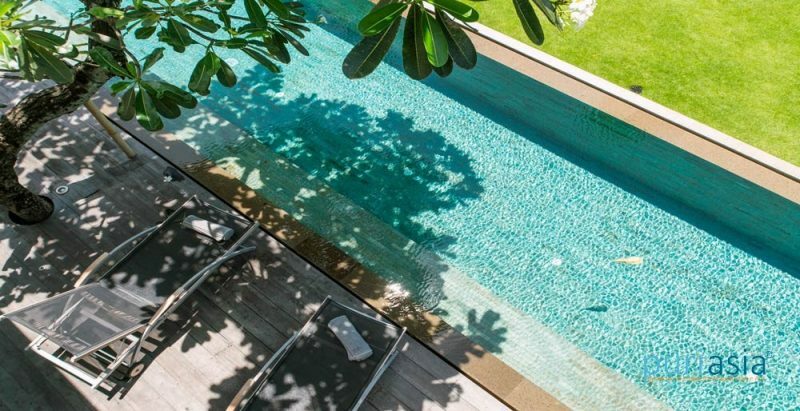 Private, peaceful and away from the sounds of the traffic, Villa Issi Bali is a concept of grand proportions, brought to life. 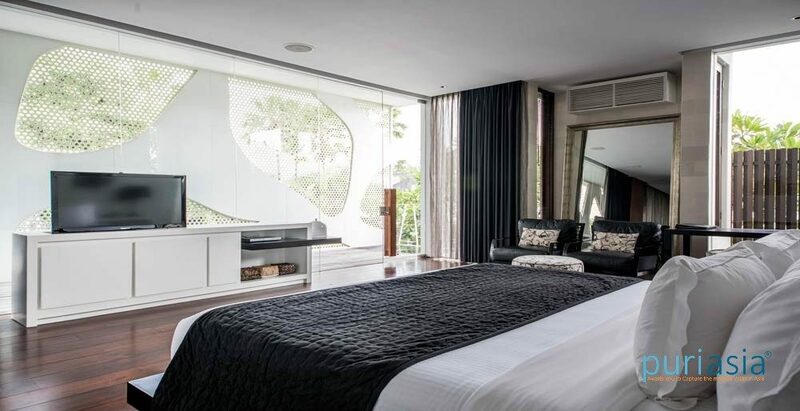 With a monochromatic theme, the Seminyak accommodation features huge doors and amazing space and original artwork, while providing high tech living and entertaining facilities in combined areas. 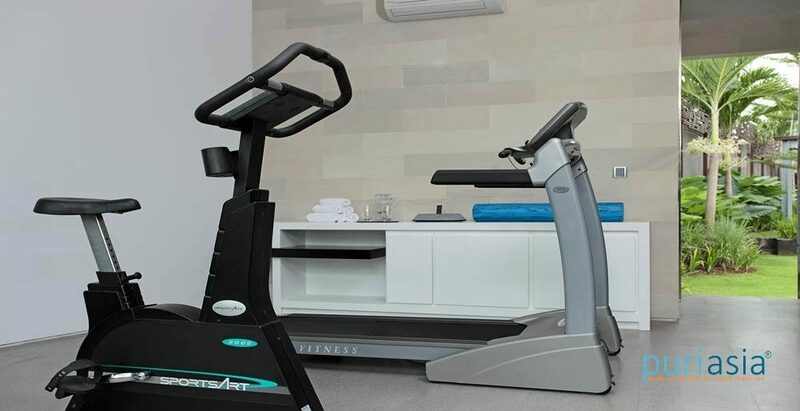 Each bedroom in this luxury accommodation features a king size bed with recycled teakwood floors, air-conditioned comfort, flat screen TV and large dressing room. 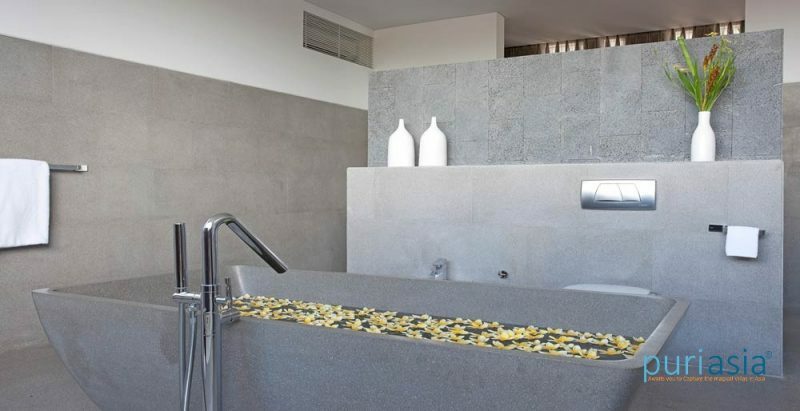 Their accompanying ensuites are a spacious combination of terrazzo flooring, bathtubs and walk-in monsoon showers that overlook the villas peaceful garden settings. 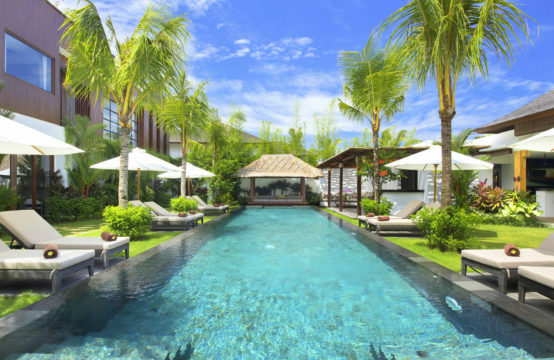 Villa Issi truly is one of the best Bali luxury resorts. Kick back and relax on the sofas and ottomans in Villa Issi’s stylish lounge. 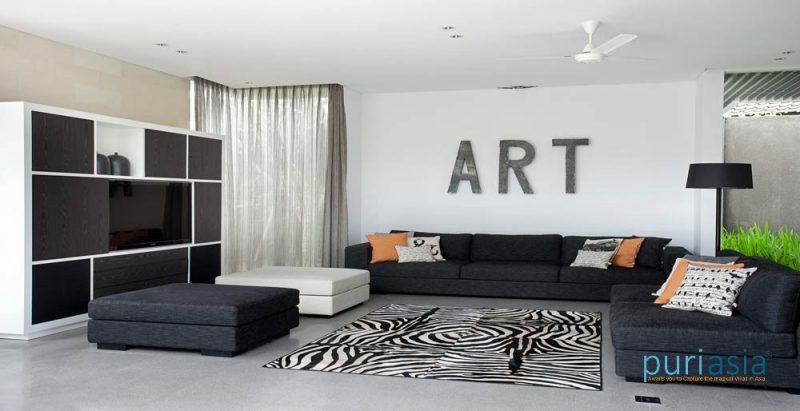 A fabulous zebra skin rug, bright cushions and quirky artworks decorate this comfortable, light and airy room which features a 55-inch satellite television, DVD player, iPod dock, and a Bose sound system that is wired to work throughout the building and can be controlled from each room. A sliding door separating the lounge from the dining area can be opened up to make one large open plan living space. 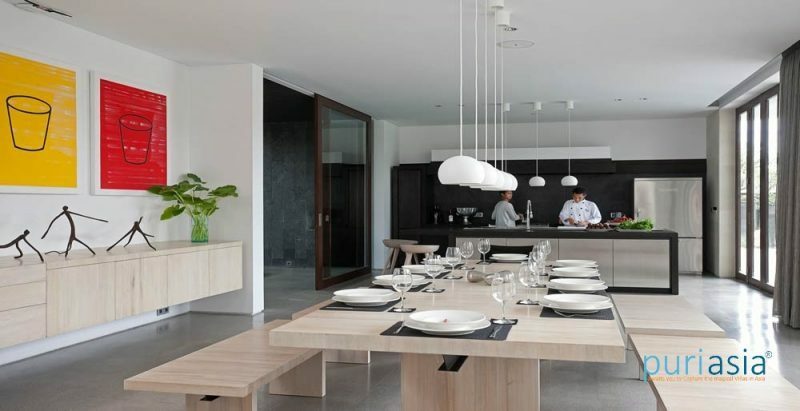 The dining area has a blonde wood table with seating for ten and overlooks the state-of-the-art, stainless steel kitchen. The lounge, kitchen and dining area all have floor-to-ceiling glass doors, which can be opened or closed at your discretion. Bali’s climate lends itself to outdoor living and there are plenty of spaces to enjoy the tropical lifestyle at Villa Issi. 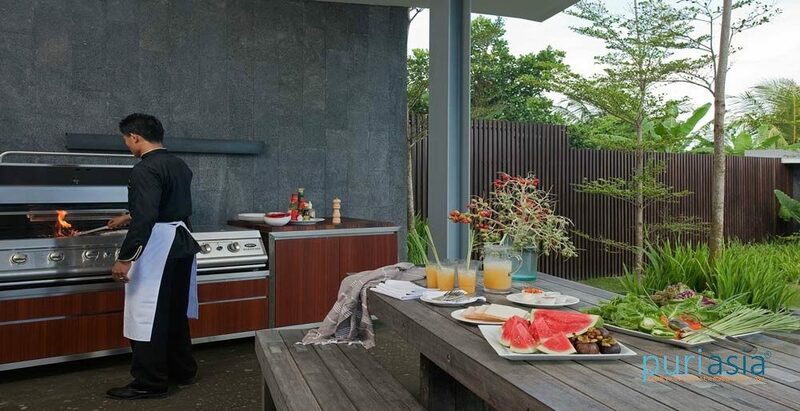 For relaxed dining look no further than the barbecue area in the garden with seating for eight and a top-of-the-range gas-fired barbecue. The ‘bridge’ deck above the pool is the perfect space to relax on a beanbag and read a magazine but when the sun goes down, this is a spectacular spot to enjoy a cocktail with friends. Living room with a 55”, flat screen, 60-channel TV and DVD player. Fully equipped kitchen with in-house chef and villa menu.